Dan Burn says he remains 100 per cent committed to Wigan Athletic despite speculation linking him with a move to Aston Villa. The players have only been back for pre-season training for a couple of days, but the transfer rumour mill has already started to throw up possible deals. One such story in the national press suggested Villa – who came within 90 minutes of reaching the Premier League last term – had lined up Burn as replacement for the outgoing John Terry. Burn, though, is not paying too much attention to the transfer tittle-tattle. “It’s just paper talk as far as I’m concerned,” he said. “I’ve seen myself linked with teams every single summer of my career and nothing ever happens. “As far as I’m concerned, I’m a Wigan player, I’m enjoying it here, we’re just having our first child, I’m settled here. “But at the same time in football you can never say never. “I could stand here and tell you I’m going to be here forever, and the next day you’re being sold. “At the same time you can want to leave a club and you can end up staying for the rest of your career. 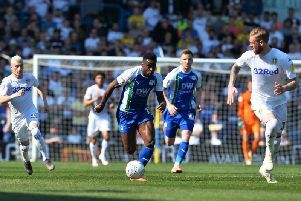 Clearly if a big club with huge resources were to come in, there may be a decision for Latics to make – especially with the player about to enter the last year of his contract. However, Burn – who joined Latics from Fulham two years ago – says he couldn’t be happier with life at the DW. “I can honestly say this is the happiest I’ve been in my career,” he revealed. “Obviously I’ve had good spells at other clubs, but I just feel the set-up here – being around the lads, the staff – is the best I’ve experienced. He’s also not losing any sleep about being out of contract in 12 months’ time – along with the likes of Nick Powell, Sam Morsy, Max Power and Nathan Byrne. “I’m obviously going into the last year of my contract – the same as a few of the lads – so I know there will be some talk,” he added. “But a year’s a long time in football, and it wouldn’t be unheard of to get into the season and still be discussing stuff towards the end of the year.